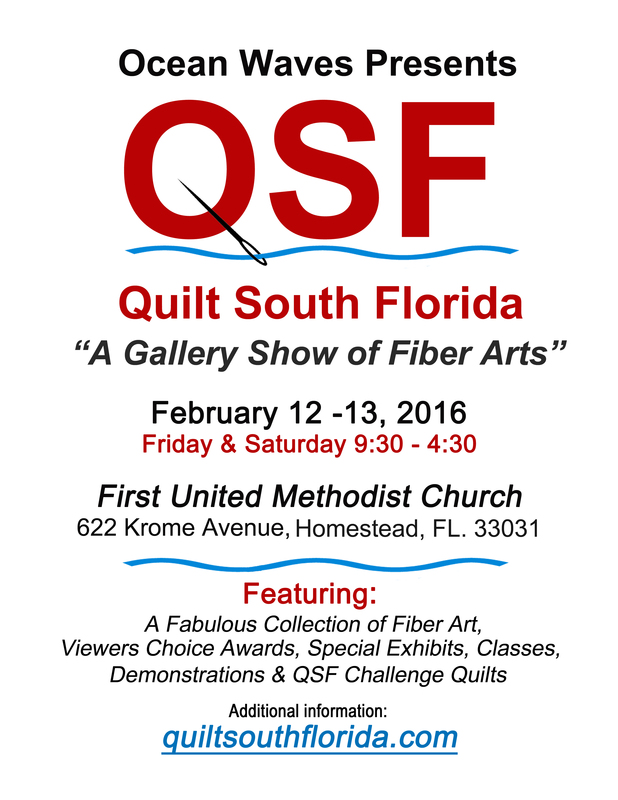 Quilt South Florida is the 1st Major Quilt Show being held in Miami-Dade since 2008. It will take place Friday and Saturday, February 12 and 13, 2016. We will have quilts, both modern and traditional from Ocean Waves Quilters, and special exhibits of wall hangings and art quilts from the Miami Art Quilters, Studio Art Quilt Associates, Concepts in Fiber and more. In addition to a fabulous collection of fiber art, we will have classes and demonstrations. Internationally known art quilt teacher Maya Schonenberger will be one of our teachers. We anticipate hundreds of visitors including quilters as well as locals and travelers. Be there when you can’t be there !!! We are starting something new. Here is your chance to take part without having to move personnel or inventory. We can set up your banners, posters, samples, sale materials and direct traffic and sales to your website. If the personal touch seems like a good idea to you, we can provide, at additional cost, video display, live video chat or the opportunity to browse your site right from the show. We would love to have you offer your wares in a conventional booth if you can be there, but don’t let distance and expense keep you away. Join us thru your own virtual vendor booth. Booths – 8’ x 10’ space includes 1 table and 1 chair for $75.00. Electronic equipment at an additional cost. Secure your space before the January 9th deadline. Download you package information or fill the form bellow and we will contact you. Note: Florida Sales Tax is 7% and will be added to your total. ​A deposit of 50% peer booth must accompany this application and be received no later than January 9th, 2016. When application is accepted, the deposit becomes non-refundable and the balance, due by January 31st, 2016. No refunds after this date. Checks payable to “Ocean Waves Quilters”. Vendor space is limited and the show committee reserves the right to refuse any vendor’s application. NOT smoke, eat or drink in the exhibit area. NOT deface, insure, mar, or in any manager damage the premises, which includes driving nails, staples, hooks, tacks, screw or such into the walls or floors. Reserves the right to alter the space of the vendor if any unforeseen circumstances should arise and require the removal of a vendor or display if deemed necessary. Assumes no liability for loss or damage by any cause to the vendor, his/her property or employees. Will provide a secured facility. Please check if a QSF Committee member for any special parking needs. QSF WILL NOT be responsible for ANY parking citations or violations.